I’ve got a delicious Banana Chocolate Chip Bread recipe that you’ll want to try right away! It’s perfect for breakfast, brunch or a snack. The cream cheese in this Banana Bread makes it so moist and the chocolate chips give it that little extra boost of sweetness. Perfection in every bite! It’s a great way to use up any overripe banana’s you have. My family loves this with a big tall glass of milk. I like mine with chocolate milk. You can’t ever have too much chocolate! This is one of those breads you can make year-round. And it is a great recipe to make for holiday gifts or to take church social, family gathering, office party or to make as special treat for a friend. 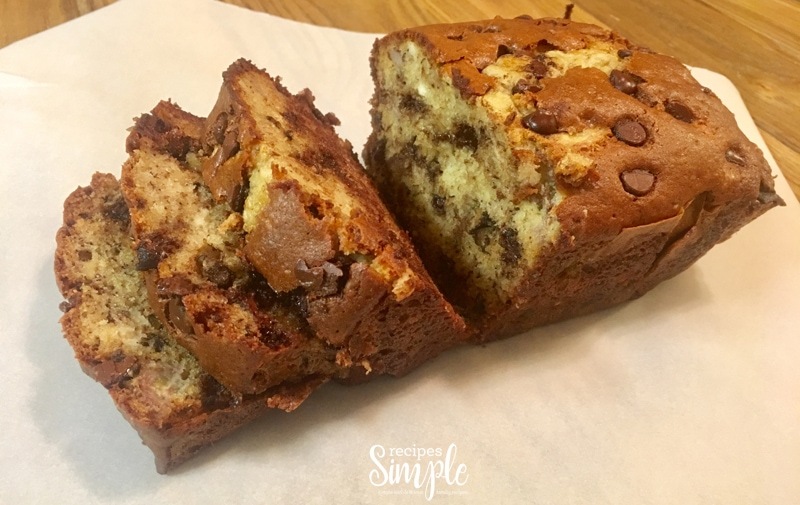 Welcome the kids home from school with a slice of this Banana Chocolate Chip Bread. It makes a yummy after school snack and they will love it! 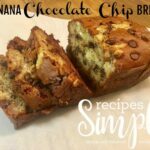 Gather all your ingredients together and get ready to wow your family with this delicious Banana Chocolate Chip Bread! 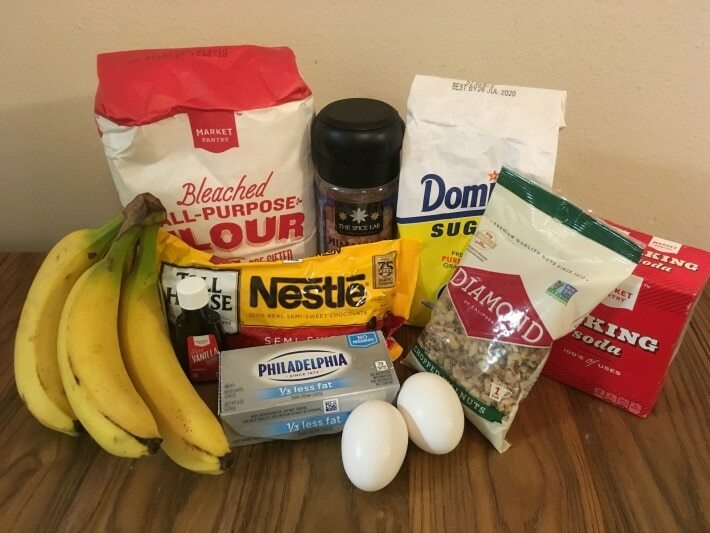 To make this Banana bread you will need three bananas, butter, sugar, eggs, cream cheese, vanilla, baking soda, flour, chocolate chips and walnuts. Spray loaf pan with non-stick spray and line bottom and sides with parchment paper. Spray again with non-stick spray. In a small bowl mash up 2 of the bananas, leaving them slightly lumpy. Thinly slice the remaining banana and set aside. Beat in the eggs and vanilla until smooth. Mix in cream cheese, mashed bananas, baking soda and salt. Stir in flour until blended. 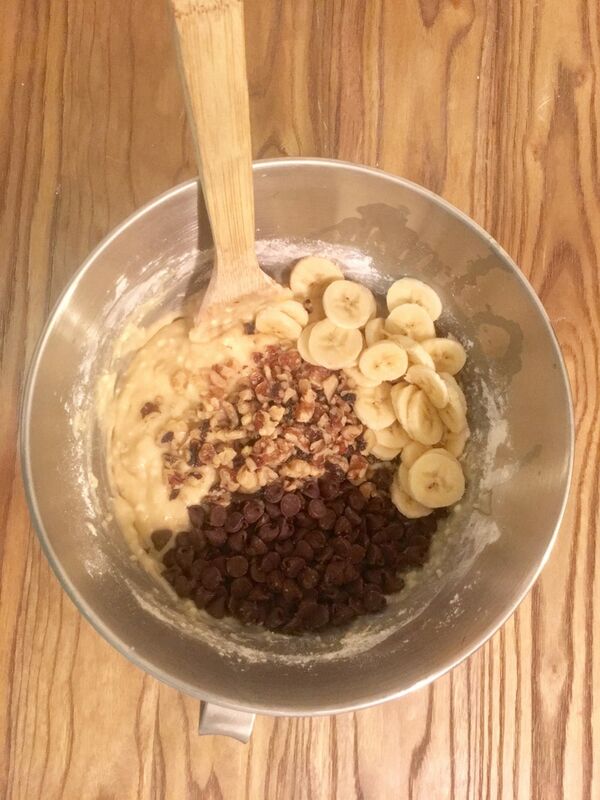 Fold in sliced bananas, chocolate chips and walnuts (optional). Pour batter into prepared loaf pan. Sprinkle a few additional chocolate chips on top. Banana Chocolate Chip Bread with cream cheese is moist and delicious and perfect for breakfast, brunch or a snack. Spray loaf pan with non-stick spray. Line bottom and sides with parchment paper. Spray again with non-stick spray.